College football is back, and Washington is favored to reclaim the Pac-12 crown. Percy Allen breaks down the whole conference and gets you primed for a conference-title run. Coach: Chris Petersen, fifth year. Starters returning: 17 (8 offense, 8 defense, 1 special teams). Jake Browning, QB, 6-2, 210, Sr.— Took a step back in 2017 after a sensational sophomore season in which he threw for 3,430 passing yards, a league-record tying 43 TDs and just nine INTs before finishing sixth in Heisman Trophy balloting. Last year, finished with 2,719 yards, 19 TDs and 5 INTs. Myles Gaskin, RB, 5-10, 193, Sr.— Arguably the greatest running back in UW history who needs 51 yards to become the school’s all-time rushing leader. The preseason All-American has tallied 1,302, 1,373 and 1,380 in the past three seasons. Taylor Rapp, FS, 6-0, 200, Jr.— A sure tackler (59 last year) and preseason All-American who leads a deep secondary that returns all five starters and six players who started at least six games. 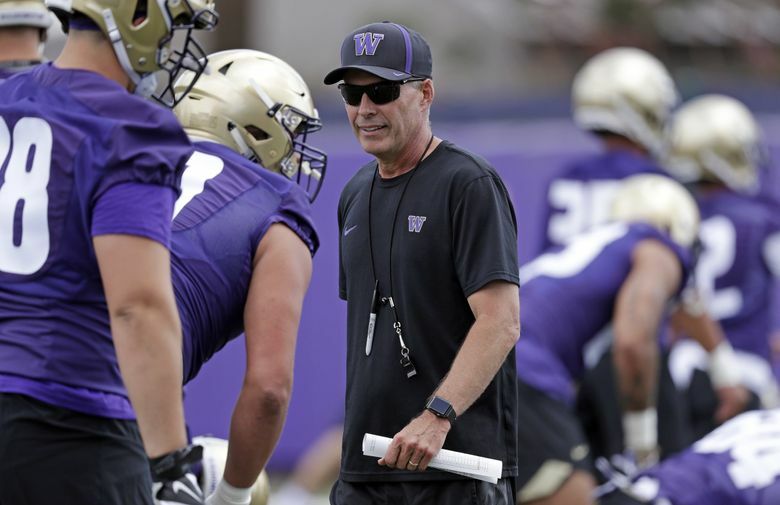 This could be a really big year for the Huskies who return a ton of experience at quarterback, running back, on the offensive line and in the defensive secondary. All-Pac-12 defensive tackle Greg Gaines solidifies the interior of the defensive line, but the edge rushers are unproven. Browning also needs to find reliable targets if the passing game is going to be effective. A trip to Utah and back-to-back road games at UCLA and Oregon are potentially troublesome, but if the Huskies clear those hurdles they could go undefeated in Pac-12 play. Coach: Clay Helton, fourth year. Starters returning: 15 (6 offense, 7 defense, 2 special teams). Cameron Smith, LB, 6-2, 250, Sr.– The AP preseason All-American led USC and was second in the Pac-12 with 112 tackles, including 10½ for a loss last season. He had the most tackles for a Trojan since Troy Polamalu tallied 118 in 2001. JT Daniels, QB, 6-3, 205, Fr.– The 18-year-old true freshman and Gatorade High School Player of the Year in 2017 skipped his senior year of high school for the chance to replace Sam Darnold who left early for the NFL draft after tossing a school record 4,143 yards last season. Tyler Vaughns, WR, 6-2, 185, So.– A sure-handed pass catcher who blossomed in the later half of the season and finished with 57 receptions, 809 yards and 5 receiving TDs. With games at Stanford and Texas in Week 2 and 3 respectively, USC could start 1-2. Helton didn’t name a starting QB after fall training camp, which may indicate he’s not entirely confident in Daniels. The so-called can’t-miss 5-star prospect was unable to compete in spring or summer drills and arrived at school last month. Still, Helton has three years of top recruiting class to surround the young QB and the defending Pac-12 champions are still the most talented team in the conference. Coach: David Shaw, eighth year. Starters returning: 14 (8 offense, 6 defense). Bryce Love, RB, 5-10, 202, Sr.– Surprised everyone when he chose to return to school after churning out 2,118 yards and 19 TDs last season. He averaged 20 carries per game and 8.1 yards per rush. KJ Costello, QB, 6-5, 216, Jr. – A hip injury kept him out of spring drills, but unlike previous years there’s no real QB controversy on the Farm. Costello has experience, but will need to his accuracy (58.8 percent last year). Bobby Okereke, LB, 6-3, 232, Sr. – The fifth-year is the leading returning tackler on a defense that loses three of its top four tacklers. He also had four sacks last season. With 73 wins in seven seasons, three Pac-12 championships and a 4-3 bowl record, Shaw has elevated Stanford into a national powerhouse since taking over for Jim Harbaugh in 2011. Expect more of the same from the Cardinal, which brings back virtually its entire offense. However, the defense could be an issue. Stanford lost a lot of defensive star power to the NFL the past two years. The Cardinal also face a difficult schedule that includes a three-week stretch in which it plays back-to-back road games at Oregon and Notre Dame before hosting Utah. Coach: Mario Cristobal, first year. Starters returning: 14 (7 offense, 7 defense). Justin Herbert, QB, 6-6, 225, Jr.– Arguably the best pocket-passer in the Pac-12 and a bonafide NFL prospect because of his size and throwing ability. A collarbone injury forced him to miss five games last season. The Ducks were 6-1 when Herbert started. Troy Dye, LB, 6-4, 224, Jr. – The Ducks’ two-time defensive MVP who has led the team in tackles the past two seasons. Last year he had 107 tackles, including four sacks and 9.5 tackles for loss. Jalen Jelks, DE, 6-6, 246, Sr.– One of the preeminent pass rushers in the Pac-12 who had 6.5 sacks, 15 tackles for loss and 58 stops last season. Considered turning pro early. Cristobal, the former Florida International head coach and Alabama assistant, served as Oregon’s offensive coordinator last season before taking over. He’s Oregon’s third head coach in as many years following Willie Taggart and Mark Helfrich. 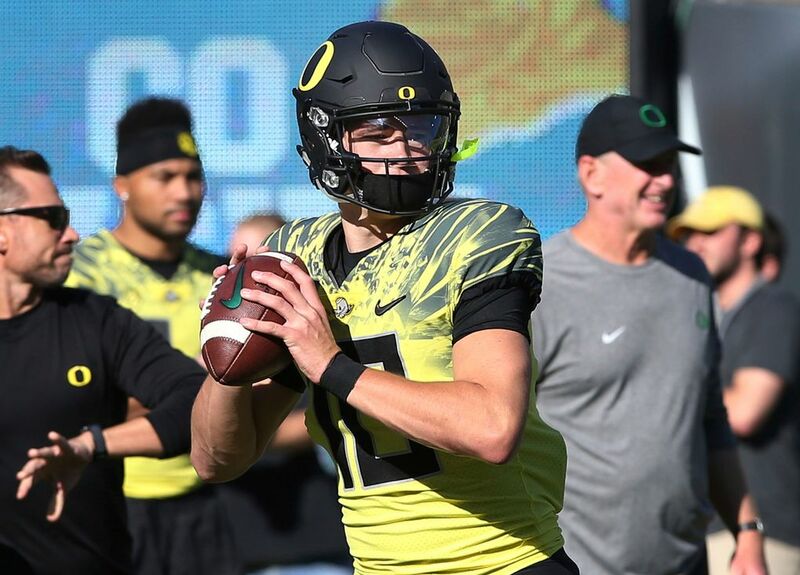 Despite the many changes in coaches, the Ducks should be fine if Herbert stays healthy. Oregon was leading the FBS in scoring with 49.6 ppg. before he got injured. Also, a defense that made massive strides in 2017 figures to take another step forward in Year 2 under coordinator Jim Leavitt. After what should be a 3-0 start, we’ll know if Oregon is a Pac-12 contender after its league-opener on Sept. 22 against Stanford. Coach: Kyle Whittingham, 14th year. Starters returning: 13 (7 offense, 4 defense, 2 special teams). Tyler Huntley, QB, 6-1, 190, So.– Had a solid season in his first year as a starter despite missing three games due to injuries. Talented runner, but second-year OC Troy Taylor wants to improve a passing game that ranked seventh in the Pac-12. Julian Blackmon, CB, 6-1, 187, Jr.– The second-team All-Pac-12 pick capped an outstanding season with two interceptions in the Heart of Dallas Bowl for MVP honors. Chase Hansen, LB, 6-3, 220, Sr.– The converted QB played safety last season where he had 51 tackles. A crowded secondary forced his move to linebacker and he’ll have more opportunities to rush the quarterback and rack up tackles among an inexperienced front seven. Utah enters its eighth season as members of the Pac-12 and it’s the only team that hasn’t won a South division title. Whittingham, the longest tenured coach in the Pac-12, is starting to feel some pressure and needs wins in big games. Last year the Utes lost by three points or fewer to Washington, USC and Stanford. The defense suffered some attrition, but Utah is traditionally is stout on that side of the ball. Historically, the Utes’ problem has been an offense that doesn’t score enough points or create big plays. Coach: Kevin Sumlin, first year. Starters returning: 18 (8 offense, 9 defense, 1 special teams). Khalil Tate, QB, 6-2, 215, Jr.– Dubbed “Mr. October,” after rushing for 327, 230, 137 and 146 yards in four victories. Averaged 128.3 yards rushing and 144.6 passing. When defenses adjusted to stop the run, he threw for 302 yards and 5 TDs in the Foster Farms Bowl. Tony Fields II, LB, 6-1, 230, So.– Forced into action as a freshman because of injuries and finished fifth in the Pac-12 with 104 tackles. J.J. Taylor, RB, 5-6, 170, So.– The diminutive speedster isn’t an every-down back and he has a history of injuries problems. Still, he’s a breakaway threat who ran for 847 yards last season. Sumlin was the perfect hire for Arizona, which fired Rich Rodriguez and paid him $6 million to not coach this year. Sumlin had success with dual-threat QBs at Texas A&M, including Heisman Trophy winner Johnny Manziel. 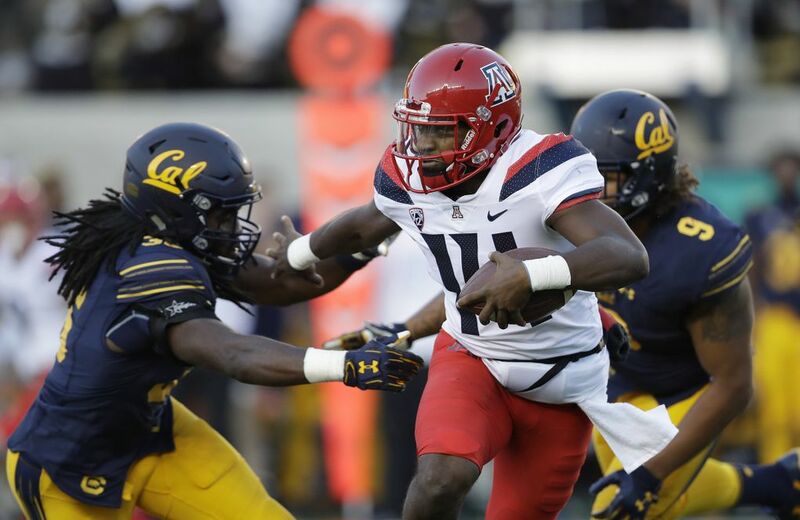 Arizona ranked first in the Pac-12 in scoring (41.3) and rushing (309.3) last year, but a young defense was abysmal. If the Wildcats can hold opponents to 30 points or less, then Tate and Co. may threaten USC and Utah for the South division title. Arizona also has a favorable schedule that doesn’t include Washington or Stanford. Coach: Mike MacIntyre, sixth year. Starters returning: 10 (3 offense, 6 defense, 1 special teams). Steven Montez, QB, 6-5, 230, Jr.– In his first full season as a starter, Montez was streaky at best. He had three games of 300-plus passing yards and seven games where he completed fewer than 60 percent of his passes. Drew Lewis, LB, 6-2, 225, Sr. – The top tackler (94 last year) on a defense that allowed 208 rushing yards per game (10th in the Pac-12). Evan Worthington, S, 6-2, 210, Sr.– Lost four DBs to the NFL in the past two years and Worthington appears to be next in line. Led CU with three interceptions and third on the team with 87 tackles. The Buffaloes regressed in 2017 after what appeared to be a breakthrough 10-4 season in 2016. Following a trip to the Pac-12 title game and Alamo Bowl two years ago, MacIntyre was rewarded with a $16.3M contract extension through 2021. However, another down year could get him fired. The Buffs have finished last in the South division six times in seven years since joining the Pac-12. CU has also had just one winning season since 2005. Coach: Justin Wilcox, second year. Starters returning: 18 (10 offense, 7 defense, 1 special teams). Ross Bowers, QB, 6-1, 190, Jr. – Bowers held off a challenge from South Carolina transfer Brandon McIlwain, but he has to cut down on the interceptions after throwing 12 last season. Patrick Laird, RB, 6-0, 200, Sr.– The former walk-on rushed for 105.0 yards per game and posted five games of at least 130. Demetris Robertson, WR, 6-0, 185, So.– A freshman All-American in 2016 after catching 50 passes for 767 yards, who missed most of his sophomore season due to a hernia injury. The Pac-12 North is loaded, but California could be the surprise team in Wilcox’s second season. Bowers is surrounded by playmakers, including Cal’s top two receivers Vic Wharton III and Kanawai Noa. Last season the Bears lost three games by a total of seven points. If Cal goes undefeated in non-conference games for a second straight year, split its home games and wins road games at Oregon State and Washington State, then the Bears will finish with seven wins and play in a bowl game. Coach: Herm Edwards, first year. Starters returning: 12 (7 offense, 4 defense, 1 special teams). Manny Wilkins, QB, 6-3, 197, Sr.– A three-year starter who garnered Pac-12 honorable mention honors last season. If given time, Wilkins can carve up a defense. He had 3,270 passing yards, 20 TDs and 8 INTs last season. N’Keal Harry, WR, 6-4, 230, Jr.– A preseason All-American who is a matchup nightmare with incredible size and explosiveness. Last year, he had 82 catches for 1,142 yards. Also set an ASU freshman record with 58 receptions for 659 yards in 2016. Chase Lucas, CB, 6-0, 175, So.– The only freshman last season to earn first- or second-team All-Pac-12 honors. He had 59 tackles and two INTs. Perhaps the most intriguing team in the Pac-12. Maybe the 64-year-old Edwards is the next Pete Carroll, an energetic former NFL coach who finds success in college football. Or maybe ASU took a gamble on a football analyst who last coached in college 30 years ago. Arizona State will need to overhaul a defense that ranked near the bottom of the league and find some running backs to balance an offense that’ll likely lean heavily on the Wilkins-Harry combination. Coach: Mike Leach, seventh year. Starters returning: 11 (4 offense, 6 defense, 1 special teams). Gardner Minshew, QB, 6-2, 215, R-Sr.– The East Carolina graduate transfer chose Washington State over Alabama and will likely win a QB derby that included inexperienced competitors. Andre Dillard, OT, 6-5, 305, Sr.– The two-time All-Pac-12 performer has started 29 games during his career. He’s a top-tier NFL draft prospect on an offensive line that returns one other starter in center Fred Maugoa. Jalen Thompson, SS, 6-0, 191, Jr.– WSU’s top tackler who had 73 stops last year and 51 as a freshman. He displayed a nose for the football while recording a team-high four INTs. The tragic suicide of Tyler Hilinski, the heir apparent at quarterback, in January rocked the Washington State program. Leach’s flirtation with Tennessee and defensive coordinator Alex Grinch leaving for Ohio State also added to a turbulent offseason. Minshew is a short-term solution for an offense that’s rebuilding while new defensive coordinator Tracy Claeys, the former Minnesota coach, has plenty of recognizable returning talent to work with. WSU has won 26 games the past three years and finished no worse than third in the Pac-12 North, but the Cougars will be hard pressed to remain relevant this season. Coach: Chip Kelly, first year. Starters returning: 12 (4 offense, 6 defense, 2 special teams). Jalean Phillips, LB, 6-5, 255, So.– Built like a defensive and in UCLA’s new 3-4 scheme he’ll be used a pass-rusher. He tallied 3.5 sacks last season – the most for a returning Bruins defender. Devon Modster, QB, 6-1, 222, So.– Last year’s backup to Josh Rosen was the No. 1 man this spring. But Michigan transfer Wilton Speight and true freshman Dorian Thompson-Robinson are intriguing options. Darnay Holmes, CB 5-10, 200, So.– A potential three-way performer who led UCLA with three interceptions last season. Also tallied 715 yards and averaged 21.7 as a kickoff returner. Could also see time this year at receiver. UCLA scored the biggest coaching hire in the offseason and landed Kelly. In four years with the Ducks, he had a 46-7 record, played for a national title, went to two Rose Bowls and a Fiesta. That’s not to mention he had a dazzling 33-3 Pac-12 record. But it would be a minor miracle if Kelly avoids six conference losses this year. It’s not as if the cupboard is bare, but Kelly was the offensive coordinator at Oregon when he took over and guided the Ducks to national prominence. This time, he has to install his up-tempo offense and recruit players – especially a dual-threat quarterback – to run his schemes. Coach: Jonathan Smith, first year. Starters returning: 14 (7 offense, 6 defense, 1 special teams). Jake Luton, QB, 6-7, 234, Sr.– Cleared to play after suffering a thoratic spine fracture in the fourth game last season. The Juco All-American passed for 3,551 yards, 40 TDs and 15 INTs at Ventura Community College in California in 2016. He has a big arm and will direct OSU’s new pro-style offense. Noah Togiai, TE, 6-4, 242, Jr.– Proved to be one of the Pac-12 best tight ends while leading the Beavers in receptions (34) and receiving yards (461) last season. Jalen Moore, 6-0, 212, Jr.– Oregon State needs playmakers and Moore is the team’s top returner in tackles (75) and passes broken up (three). Smith, Washington’s former offensive coordinator, is the youngest coach in the Pac-12 at 39. The first-year coach probably wouldn’t have been hired anywhere else, but he’s a natural fit at his alma mater where he rose from a walk-on to a four-year starting quarterback who led OSU to an 11-1 record as a senior in 2001. Smith’s return to Corvallis, Ore. is a good story, he’ll need time – and a massive increase in talent – to resurrect a team that hadn’t had a winning season since 2013. Considering a brutal schedule that includes trips to Ohio State, Stanford and UW, the Beavers would be fortunate to double last year’s win total.